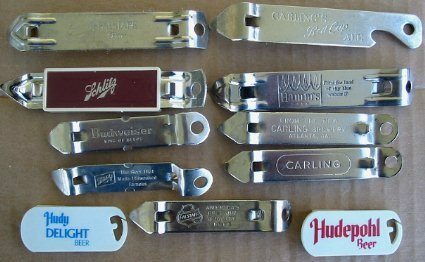 Lot of 11 different Style I openers. Includes 2 Falstaff, 1 Budweiser, 3 Carling, 2 Schlitz, 1 Hamms, 2 Hudepohl. Common style openers, but a nice clean lot. Want any details, just ask. Of note, the one Carling says From the New Carling Brewery Atlanta GA. The 2 Hudy are a hard plastic.